Created by Roger Peet. Anti-establishment message with animal trap. 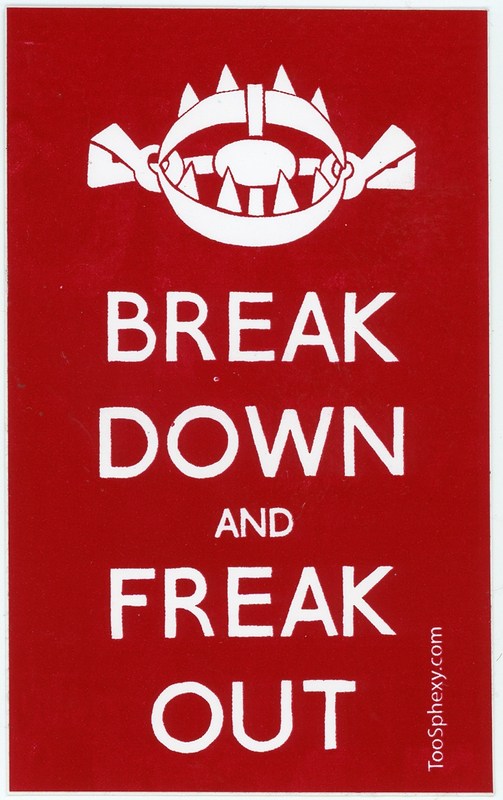 “Break Down and Freak Out” serves as an antithesis culture jam to the British classic and internationally known poster “Keep Calm and Carry On." During the outbreak of WWII, the British Ministry of Information was appointed by the British government to design morale-boosting posters, which is how the “Keep Calm and Carry On” posters originated. He writes, "Look, here's a parody of the "Keep Calm and Carry On" poster. I think that the original is a terrible way of being alive, a motto for sheep. This is my response. I'm an artist, printmaker, and writer living in Portland, Oregon. My work tends to focus on civilized bad ideas, predator-prey relationships, and the contemporary crisis of biodiversity and what can and can't be done about it. I'm a member of the Justseeds Artists' Cooperative, a group of North American artists producing socially and environmentally engaged artwork."